Q: Food allergies - My dog has allergies, can they eat Nature’s Gift food? 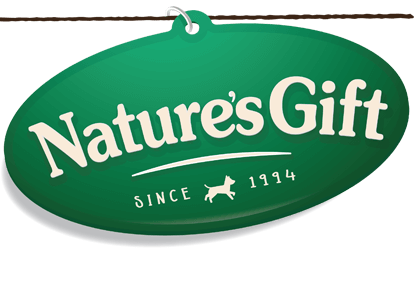 Our Nature’s gift products are not specifically formulated for dogs with known food allergies or intolerances. In general, protein allergies are the most common types of food allergies in dogs (i.e. beef, chicken etc.,), so depending on what your dog is allergic to, they may be able to tolerate our products. We would recommend looking at our ingredients list on our packaging or website and speaking with your vet before making any dietary changes. Q: Animal testing - Do we test our products on animals? None of our Nature’s Gift products are tested on animals in laboratories or similar. To ensure our products are accepted by a wide range of dogs, we do conduct palatability trials (taste testing trials) before they are made available in stores. This involves offering our new products to our own pets, those of our friends as well as independent groups of dog owners and seeking feedback on how well they were liked by dogs. Q: Antioxidants - What are the antioxidants referred to in the ingredients list and why are these in our products? The antioxidants included in our products are natural tocopherols and natural vitamin E. These are included as fat stabilisers to avoid rancidity and play a significant role in the shelf life of the product. There are several side benefits to this ingredient apart from stability, and these include general health for the animal via the antioxidants included. Q: Are all the ingredients listed on our products? Are you sure you haven’t left some out? We list all ingredients on our products to ensure our customers can make an informed choice when deciding to purchase or use our products. Our recipes are very simple and contain real meat, fresh vegetables (e.g. carrots and potato) with whole grains, as well as all the essential vitamins and minerals dogs need in their diet. Q: By-products - Do we use meat by-products and offal in Nature’s Gift canned foods? We include a combination of both muscle meat, bone and organ meat in many of our Nature’s Gift products. All our meat based ingredients are sourced from approved Australian suppliers who must meet our strict quality standards. Although bone and organ meat are classified as animal by-products which can carry a stigma for being the ‘rejected’ parts of an animal, they actually contain many nutrients that both cats and dogs require for optimum health and a complete and balanced diet. Q: Canola oil - What is the purpose of canola oil in Nature’s Gift pet food? Canola is a monounsaturated oil which contains omega-3 fatty acids that will aid in maintaining healthy skin and coats. Canola oil is also a good source of fat and energy, which is required in any complete and balanced diet. Q: Corn - Do we use corn in any of our products? No, we do not use corn in any of our products. Q: Differences between cat and dog food - Can I feed Nature’s Gift dog food to my cats or vice versa? There would be no harm in occasionally feeding cat food to dogs, or dog food to cats, however, we would recommend feeding the correct species-specific food long term. As dogs and cats have different nutritional requirements, feeding the correct food is very important to ensure they are not missing out on any essential nutrients. Q: Ethical sourcing - How do we ensure animal rights of the chicken, lamb etc., which is sourced for our pet food? We only source our meat approved Australian suppliers who must meet our strict quality standards. Although we endeavour to source free range and organic ingredients unfortunately our Nature’s Gift range is not certified organic. Q: Feeding - How should I feed Nature’s Gift products to my pet? Nature’s Gift’s Nourish, Sustain, Cans, Alutrays, Gourmet Bites and Rolls are complete and balanced foods, designed to meet the special needs of either puppies or adult dogs.. Our highly nutritional formulas are based on quality fresh meats, vegetables and other natural ingredients which give our food exceptional taste and digestibility. A good diet is one of the most important steps any owner can take toward providing care for their pet. In general, adult dogs can be fed once a day or ½ the suggested feeding amount twice a day, depending on the breed and lifestyle. Puppies from 6 weeks to 3 months may be fed up to 4 times per day. Puppies up to 6 months may be fed 3 times per day and then twice daily up to the age of 12 months. Treats and (under supervision) dental sticks/chews or raw meaty bones can be given in addition to a complete and balanced diet, and we suggest to feed these in moderation to avoid weight gain. Q: Garlic - Why do we use garlic in our wet food? Isn’t it toxic to dogs? Garlic has been used for thousands of years for medicinal purposes to help boost the liver and cardiovascular system. It also has immune boosting properties and can aid in inhibiting bacteria and fungi growth. Garlic is also an appealing palatant to dogs, which is why we have included this in some of our products. Many websites and vet clinics do list garlic as a toxin to dogs, as along with lots of other foods, it will be toxic in large enough doses. As a precautionary measure and to prevent misconceptions by pet owners, it is easier to advise not to feed garlic at all. This also deters owners from thinking that if their animal will be fine with a little bit of garlic, they will be ok in large doses every now and then, or a little bit more won’t hurt as they are a big dog etc. With home cooking or feeding left overs, pet owners may not pay attention to how much garlic was included, or how much was in the portion that was fed to the animal. We ensure that the inclusion of garlic in our products is not only minimal, but consistent in each batch, as the same recipe and process is followed each time. As you have seen, garlic regularly comes under attack regarding it’s harmful effect on dogs and cats. This is due to the fact that it shares an association with the onion, as they are both from the same genus, Allium: onions are Allium cepa, whereas garlic is Allium sativum. And even though they are related, garlic and onion don’t have the same composition so the effects they produce are very different. Onions are known to produce ‘haemolytic anaemia’ in dogs and cats, which is where red blood cells are forced to burst. Dogs and cats are highly susceptible to onion toxicosis: Consumption of as little as 5g/kg bodyweight of onions in cats or 15 to 30 g/kg in dogs has resulted in clinically important hematologic (blood) changes. Onion toxicosis is consistently noted in animals that ingest more than 0.5% of their body weight in onions at one time. The compounds within onions which cause this effect are n-propyl disulphide and to lesser degrees, thiosulphate. These compounds though, are only found in miniscule amounts in garlic, so unless very large quantities of garlic are consumed, it is unlikely that the same side effects will be produced that consumption of onions can. (Note that the dose administered in this study was roughly the equivalent of 10 cloves of garlic for a 10kg dog, and that some dogs did develop subclinical effects on their red blood cells at these high doses). Therefore, to develop clinically significant haemolytic anaemia from garlic, the animal would need to have consumed a very large dose – well in excess of the doses contained within our products. It has been estimated (in The Complete Guide to Natural Health for Dogs and Cats by Dr. Pitcairn) that for a 5kg dog, a ‘safe’ dose of garlic would be half a clove per day. As a precautionary measure however, we do discourage owners from feeding home formulated diets inclusive of garlic without specific guidance from their veterinarian. Q: Gelling agents - Which gelling agents do we use in our wet food? We use natural gelling agents derived from plants to assist in creating the texture of our wet foods. Q: Glycerine - Where do we source the glycerine used in Nature’s Gift foods? The glycerine in our Nature’s Gift products is 100% plant-derived. Q: Grains - Is Nature’s Gift pet food grain-free? Our Nature’s Gift range of products are not specifically formulated to be grainfree. As we are aware that some dogs are not able to tolerate grains, our team is currently looking into grainfree products for our Nature’s Gift range in future. Q: Grains - There is a lot of recent publicity about grain-free diets being good for pets, but a lot of our products contain grains – why? Barley is very high in calcium and magnesium. It is alkaline and excellent for cleansing and cooling the blood. It cultivates nerves and muscles and helps keep the body limber. Oats are an excellent source of iron and an ‘intestinal cleanser’. This grain is also high in silicon, which helps the development of muscles, the brain and nerve structures. Rice contains vitamin B, phosphorus, potassium, magnesium and calcium. It also contains gamma oryzanol, a natural nutrient beneficial in increasing lean muscle mass. There are a lot of different information available on which food is best for pets, so speaking with your vet will be the best way for you to determine which food would be most suitable for your furry friend. In general, we would certainly recommend food which is complete and balanced by AAFCO nutritional standards, to ensure that your dog receives all the necessary nutrients in the appropriate amounts to keep them healthy. You can be reassured that all our Natures Gift range (aside from our Mini Treats) are formulated to be complete and balanced. Q: Halal - Are Nature’s Gift products Halal? No, our Nature’s Gift range is not halal certified. Q: Horse Meat - Do we use any horse meat in our products? Absolutely not. We are a member of the PFIAA (Pet Food Industry Association of Australia) and adhere to their regulations stating that horse meat is not permitted to be used in the manufacture of pet food. Q: Ingredient safety - Are the Nature’s Gift treats safe for my pet? I heard about some treats containing ingredients from China which were toxic to pets? Please rest assured that we only source our meat from approved Australian suppliers who must meet our strict quality standards All of our products are manufactured in Australia in either our NSW, QLD or VIC factories. We are pet owners too, and as such, take product quality and safety very seriously. We can confirm that all of our products are produced under extensive product quality control processes and comply with Australian Standard AS5812. This Standard addresses the management of raw material selection and handling, factory management, product formulation, process monitoring and control and labelling consistency of finished pet foods to ensure product quality and integrity. Q: Overweight dog – What can I do if my pet is overweight? In general, if a pet is overweight, it may be necessary to feed less than the guide suggests, depending on how much weight he or she needs to lose, over what amount of time, and whether or not exercise can be increased to help them lose weight. Just like humans, dogs become overweight by consuming more calories than their bodies require to meet their energy requirements, as the excess calories are stored as fat. Indoor dogs which don’t receive a great deal of exercise will require a lot less food to meet their energy requirements than working farm dogs, for example, so if these two dogs were fed the same amount, the indoor dog would probably end up overweight and the working dog underweight. As with other pet food feeding guides, Nature’s Gift’s guides are general in nature only. Our recommendations may need to be altered depending on factors such as your dog’s activity level, any illnesses it may have and whether it is under- or overweight. We recommend that you consult your veterinarian for definitive advice, as he or she understands your pet, your pet’s medical history, and the lifestyle you lead. As all of our Nature’s Gift products (excluding our Mini Treats) offer complete and balanced nutrition, it is not necessary to add supplements or extra food in between meals. The only exception would be the offering of our healthy treats as rewards for obedience training, plus a dental treat a couple of times per week to promote healthy teeth and gums. Fresh water should be available at all times. Q: Palm oil - Do we use Palm Oil in any of our products? No, we do not use Palm Oil in any of our products. Q: Potatoes - Aren’t these toxic to dogs? As the potatoes contained in our Nature’s Gift products are both ripe and cooked, this removes any potential health problems for dogs and means they can gain the nutritional benefits of this vegetable in their diet. Potatoes are a member of the nightshade family, along with tomatoes, eggplants and several other veggies. All members of this family are known for protecting themselves with alkaloids, which can be toxic at high enough doses, and potatoes are no exception. They produce two alkaloids: solanine and chaconine, which are dangerous to humans as well as dogs. Ordinarily, a potato contains only small amounts of both. However, sprouted or green potatoes can have unusually high quantities of solanine, particularly within and just below the skin. At high enough doses, solanine can cause diarrhoea, nausea, abdominal pain and in extreme cases, organ failure and death. Raw potatoes are also harder to digest because they are very high in starch, which is a very long chain carbohydrate that the body (human or canine) struggles to break down. Raw potatoes can pass through the entire digestive system without actually being digested, which can cause nausea, abdominal discomfort, pain and bloating. Q: Shelf life - How long does a can of Nature’s Gift food last after being manufactured? Our canned products can last up to 3 years from the manufactured date, and our alutrays last up to 2 years from their manufactured date. Our cooking and sealing process ensures a stable environment for the product within. Unless the can or tray sustains damage which may compromise its sealing, the contents within should remain wholesome until the best before date is reached. Q: Sugar - Do we add sugar to Nature’s Gift Products to make them more palatable to cats? We have elected to include a small amount of sucrose into a few of our Nature’s Gift products, which will make up a very small percentage of the product. Sucrose (or standard table sugar) is a naturally occurring substance, which is derived from cane sugar and is used for stability enhancement, texture, and flavour enhancement via maillard reactions with protein in the cooking process, of which sugar (sucrose) is a key element. We can confirm that the sugar we use is safe, naturally produced, and grown in Australia. If you are looking for products that do not contain sugar/sucrose, the majority of our Nature’s Gift range including the Sustain dry, wet trays, wet cans, and rolls are free from sugar/sucrose, however you may wish to avoid our Nature’s Gift Gourmet Bites, Nature’s Gift Nourish and Nature’s Gift Mini Treats as they also contain a small percentage sugar/sucrose. We do encourage you to review our ingredients, as we list all ingredients our packaging to ensure customers can make an informed decision when electing to purchase and use our products. Q: Water content - I have heard that a lot of a can of pet food is just water – is this true? Fresh meat and vegetables will naturally contain a high moisture content, so our wet food products will also naturally retain a higher moisture content compared to dry foods. The proportion of moisture in our cans is a reflection of that which is in our fresh ingredients. For pets which don’t drink a lot of water, feeding canned food can be a good way to help ensure that they stay well hydrated, which is important for the health of all pets. Q: Wet food differences – Why does the food in Nature’s Gift cans look different to the trays? Nature’s Gift 700g cans and 100g trays are different products. The cans include our Meal Time and Casserole range, while the trays are used for our Gourmet, Casserole or Loaf Style products. The quality of these products is equally optimal, using the same high quality meat and fresh ingredients; but the recipes do differ. This is mainly due to the different manufacturing methods used for the cans and trays, where the processing equipment requires different consistencies. All our wet foods are complete and balanced sources of nutrition for your dog. Dogs enjoy variety, so you may wish to mix up your dog’s feeding to introduce different flavours and textures. Q: What oils do we use? Vegetable oil, canolia oil or fish oil, depending on the product and variety. Q: Wheat allergies - My dog has a wheat allergy, can they eat Nature’s Gift food? Our Nature’s Gift products have not been specifically formulated to be grainfree, so if your dog is not able to tolerate grains, our range may not be suitable.